Note*: Fastest competitor per country will be awarded for all 43 countries who participate. The rest of the prizes are only eligible for European competitors. As a long-standing tradition in the history of European Championships, we will also host the Mosaic Building competition at Euro 2016. 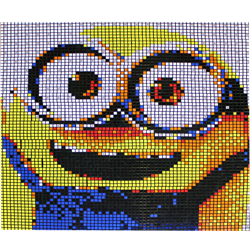 This is an unofficial event, where a team of competitors use hundreds of Rubik’s cubes to create a funny, nice or simply beautiful image. 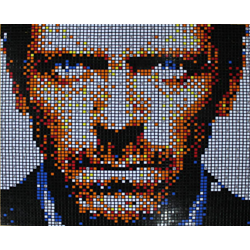 This year, the Mosaic contest will be organized by RubiArt. Each team can include a maximum of 4 people, all of whom must be competing at Euro 2016. 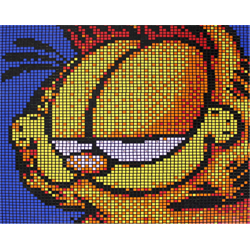 Each mosaic has to fit into a frame, which has 23x23 cubes dimensions. There will be 90 minutes for the teams, which includes setting up, building the picture, taking photos and administrating. Competitors accept and keep the rules. 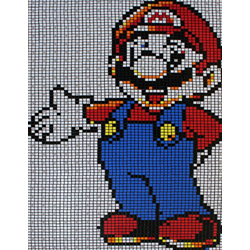 Team "4 Cubers 540 Cubes"
Team "I accidently a mosaic"
Team "This is not a team"
Team "The Good, the Bad, the Ugly and Miri"
Teams will be held responsible for any loss or damage to the cubes provided. Team members are responsible for keeping their official competition schedule and their mosaic building schedule. The picture must not be vulgar, offensive or political. Pictures will be judged by a team of judges, based on: creativity, difficulty and design. Teams will be stopped at 85 minutes, so the officials can administer the attempt.